The two founders of the92.net visited one of the fabled slogs of the 92 with a day trip to Carlisle. 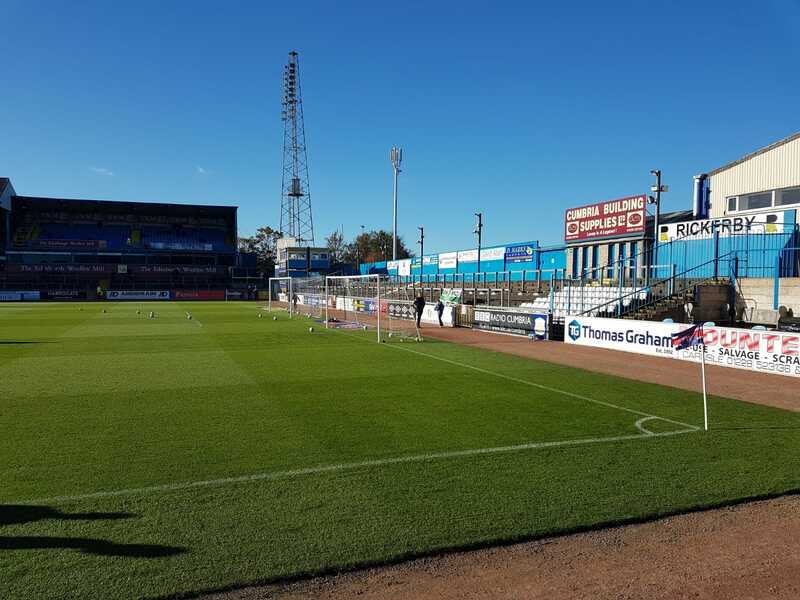 Carlisle hosted Yeovil in a League Two clash, where football most certainly wasn’t the winner Follow author Michael on Twitter here. Brunton Park, Carlisle. Home to one of the most remote grounds in the 92. 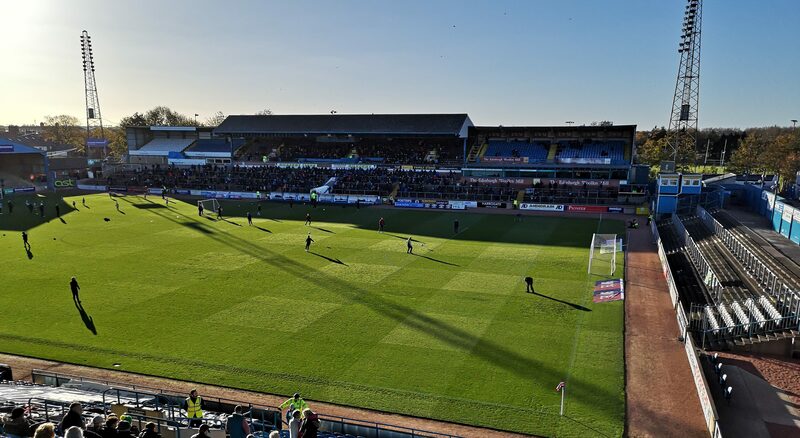 For many clubs in the football league, the away trip to Carlisle is the longest they’ll have to make. When the fixture list computer is unkind, a dreaded ‘away to Carlisle United on a Tuesday’ can be the most daunting thing to see with the release of the fixtures in late June. Both of us at the92.net are Yeovil fans, and following our convincing thumping of Notts County, we decided it could be time to venture to the most northern of the 92. Fortunately for us, we live in Nottinghamshire, so the perilous 670-mile round trip facing our fellow fans was ‘just’ 440 miles. We decided to trek a slightly different way to mark the fact neither of us fancied doing such a drive in one day. A fellow ground hopping gent suggested a drive to Crewe, just over an hour from us, then taking a train to Carlisle, which is just under 2 hours. The day trip was planned, and the trains booked early enough to keep costs down. Our view from the Pioneer Stand onto the rest of the ground. 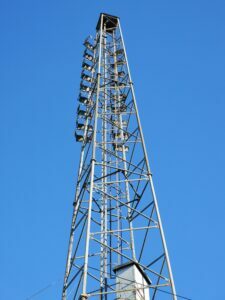 Our journey took in several grounds en route, starting with the floodlights of the City Ground, home to Nottingham Forest as I passed the outskirts of Nottingham. The home of Championship club Stoke City, Bet 365 Stadium, was passed, with snow falling, as we whizzed along to Crewe Station. Gresty Road loomed ominously from our vantage point on the platform before boarding northbound. As we further north, we passed through Wigan, where north of the Station we could see the DW Stadium, followed shortly after that by Deepdale, hosting Preston North End against Rotherham that afternoon. At Lancaster station, we also glimpsed the well-named ‘Giant Axe Field’, home to Northern Premier League club Lancaster City. 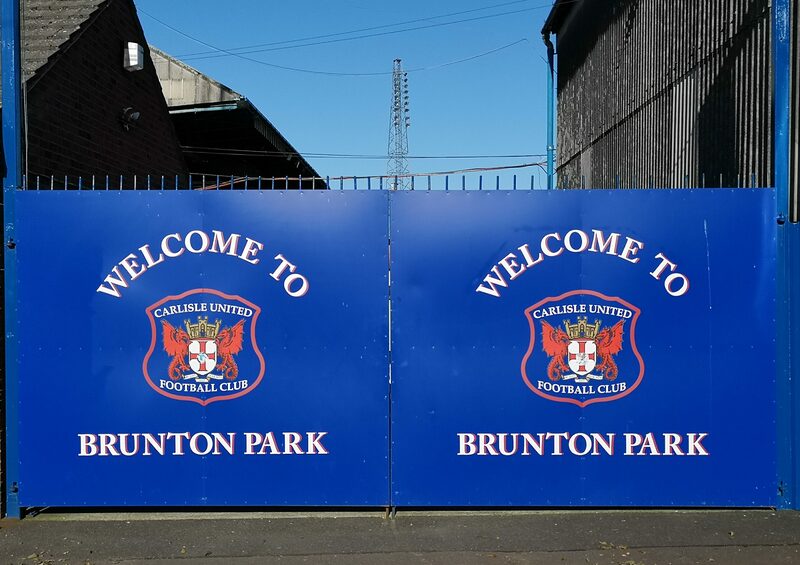 Welcome to Brunton Park, home to Carlisle United Football Club. The weather was clear and crisp as we sped through the Lake District, giving us a great chance to soak up the wonderful views. Once in Carlisle, the town gates greeted us as we walked to the Castle. The Twitterverse had suggested The Griffin, just by the station, which had the early kick-off and food! Sorted! Pete was immediately drawn to the Yorkshire Pudding Wrap, essentially a swiss roll, but with Yorkshire pudding as sponge and beef as jam. Once we’d devoured the monster food, we took the 15-minute walk to the ground, had a walk around, before heading to The Beehive for a quick pre-match pint. The ground is the largest stadium in England that is not all seated. Each of the four stands is quite distinct in their appearance. The away fans were housed in the most modern East Stand. Juxtaposed 20 yards beyond the pitch with a view to moving the pitch with further development work on the rest of the stadium. The executive boxes aren’t even complete. The Warwick Road End looks like a cowshed from the outside, with its unique three-pronged roof. It’s where the ‘noisy’ home fans congregate. Although we wouldn’t hear a peep from them during the game! 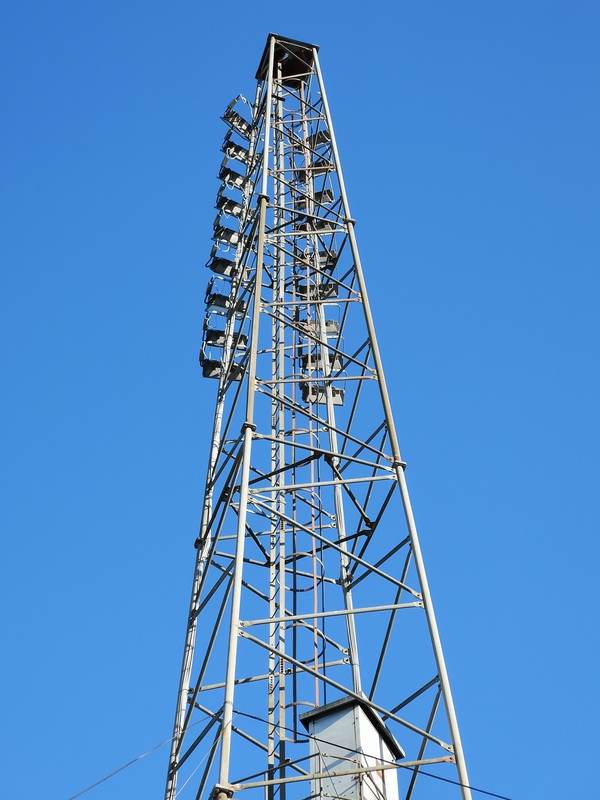 The funky floodlights at Brunton Park. The Main Stand is really four or five different stands cobbled together. An exposed paddock on the lower half, with a central old wooden stand above it. To the left and right of the upper wooden section, lay two box sections with plastic seating. Finally, on the right, was something resembling a lego control tower. Last, but certainly not least, is the Petteril End. An under-used, over-exposed terrace, screaming out for an abundance of fans to varnish it. Instead, it’s not used unless a large number of away fans are expected. With Yeovil, who rarely travel well, facing 670 miles, there weren’t enough today. For the first half, we took our seats low in the East Stand, as Yeovil attacked the Petteril End to our right. The first half was stale at best, with Rhys Browne passing up on two good opportunities to give Yeovil the lead. A couple of head injuries extending the half well into the 50-minute mark. 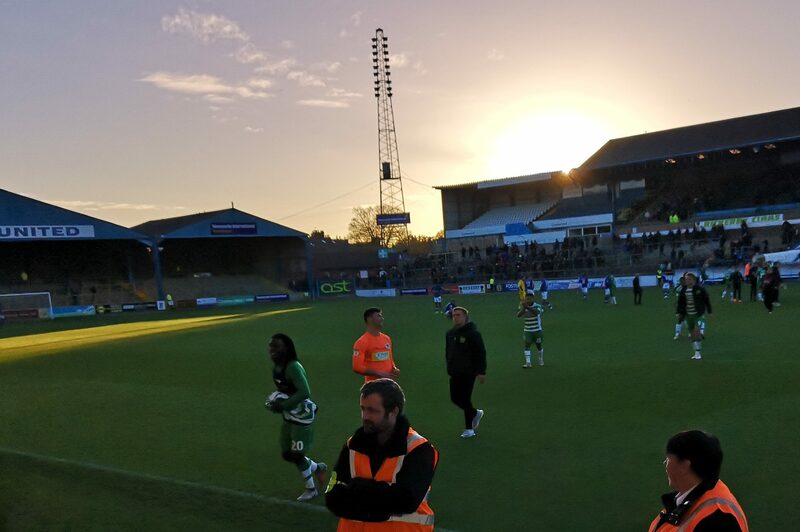 The afternoon sun caused no end of glare in the first half, so we went to the back of the stand for the second half, but that didn’t improve things. Another torrid 45 minutes of football, with both teams intent on losing possession. As the half wore on, the sun, like the game, was sinking. That glare was back. Carlisle had some of the better football towards the end, but Yeovil broke in the dying seconds and won a free-kick on the edge of the box. The Yeovil defender Tom James spanked it, it took a deflection and… GOOOOAAAALLL!!!!!! Bonkers! An absolute smash and grab. 1-0. 96th minute. Madness descends upon the small hoard of traveling Yeovil fans. 7 hours on a coach for some, for one absolute moment of magic. The final whistle goes soon after. The fans and players merge at the seam between pitch and stand to celebrate and rejoice together, with Nathan Baxter, the on-loan Chelsea keeper, leading the celebrations. Sessi D’Almeida and Nathan Baxter celebrate with the Yeovil faithful. Once we’d settled down, we strolled back into Carlisle. We had over an hour, so popped into the Griffin again and watched the evening game, before jumping on our train back south through the Lakes. Reflecting on Brunton Park(and not wanting to remember too much from the game), we both liked the decaying but much-loved look of Brunton Park. As away fans, we were confined to the new(ish) stand but would have preferred either the home terrace or the old mixed Main Stand. Alas, from our perch, we had great views of both and the surrounding area and hills of the Lake District far in the far distance. For many, it is a big day trip to get to Carlisle. But Brunton Park is such a romantic old ground and the town decent too, it’s one of the better trips in doing the 92. If like Michael you fancy blogging about your experiences doing the 92 league grounds drop us a tweet to @the92dotnet. Are you on a journey to the 92 club? Use our free website to keep track!